Alfa Romeo Mito twin-clutch driven | What Car? A twin-clutch semi-automatic gearbox has become a must-have alternative to a conventional automatic for any car maker looking to reduce CO2 emissions. By minimising traction interruptions during shifts, they improve all-round efficiency. A side benefit is that, done right, they make pretty good semi-manual gearboxes, too. Not all twin-clutch 'boxes are the same, however. There are dry-clutch systems such as Volkswagen's DSG (relatively cheap and compact, good for economy and emissions and easy to combine with engine stop-start system) and a wet-clutch system such as Porsche's PDK. These can take greater torque inputs and are smoother when setting off and creeping into parking spots. Now Fiat Powertrain claims to have a double dry-clutch 'box that delivers most of the best of both worlds. It can handle up to 259lb ft of torque, opening up the possibility of a wide range of applications, but it's compact enough to fit into a small engine bay. 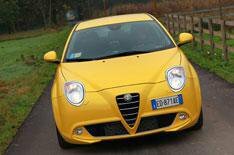 It's called TCT, and it appears first in Alfa Mitos powered by the 135bhp 1.4 turbo engine. It's impressively smooth and quick-shifting, too, whether being used as a manual or an auto one of the best we've encountered, in fact. It brings only marginal fuel savings over a manual gearbox for an additional cost of £1250 (plus £100 if you want paddle-shifters on the steering wheel), but it's about 10% more fuel-efficient than a conventional auto. An engine stop-start system is part of the package, but the restart process is a bit sluggish, making pulling out into the traffic more fraught than it need be. Giulietta 1.4 turbo and 2.0 diesel models will be next to get the TCT 'box, in spring 2011. Currently, it has six speeds, but a seven-speed version is possible and it's also compatible with four-wheel drive, so Fiat's American partner, Chrysler-Jeep, stands to reap the benefit in time. The Mito still has its faults, but TCT isn't one of them.